I recently came across this neat photo of Ottawa's old streetcars, running along Rideau Street in front of the old train station (currently the Government Conference Centre). 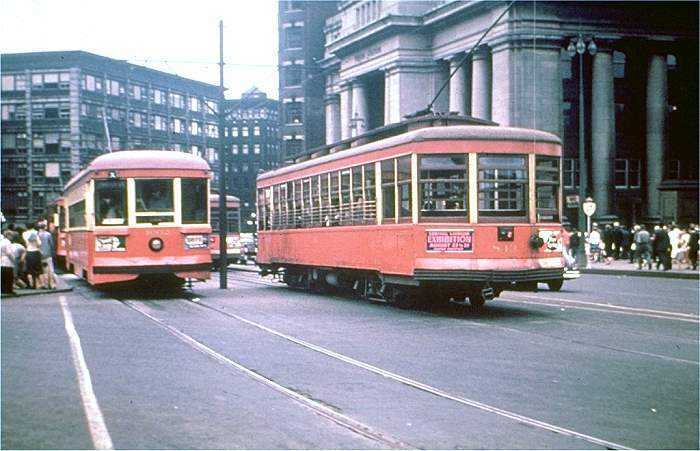 Streetcars were gradually abandoned in Ottawa through the 1950s, and the tracks were abandoned by 1960. Looking back, it would be nice to be building more light-rail transit around something like these, wouldn't it? Photo from Dave's Rail Pix. Streetcars are for fairly slow, pedestrian or cyclist paced, local transit with frequent stops and generally not a long haul. They are the equivalent of a No 2 bus route. LRT has stops much further apart, more station like, with higher speeds between stations, so trips can be over longer distances faster than most people can walk or cycle. Think #95 BRT. LRT has one function, streetcars another, different one. There is a proposal percolating forward for reintroducing a streetcar service from the War Museum to Sparks Street to ?Confed Sq/Market, which would complement walking on the mall, and be useful for tourist and some local trips. But it is not LRT nor would it compete with LRT. The streetcar idea for Sparks is a good one; the ones at Disney are hugely popular to ride along Main Street America.